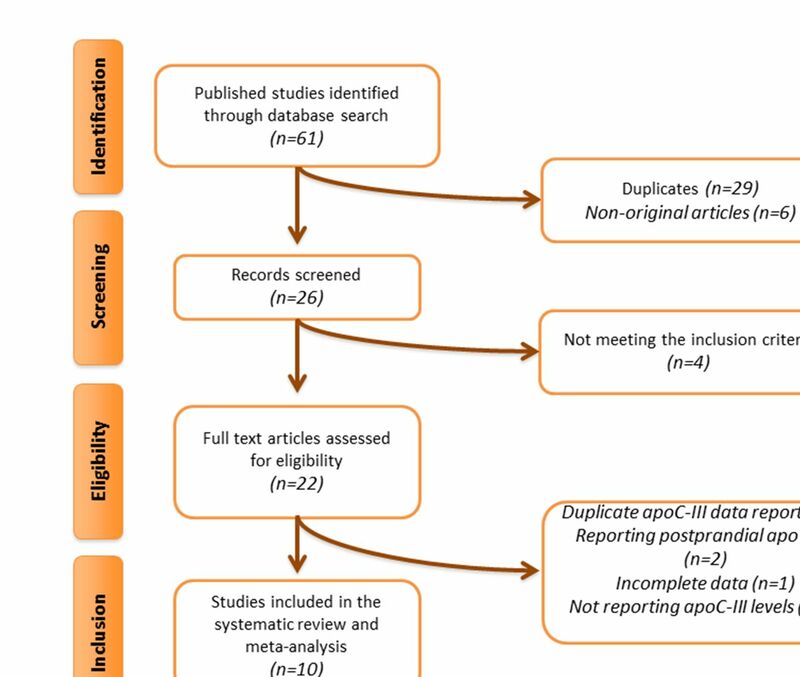 Objectives This meta-analysis of randomised placebo-controlled clinical trials aimed to assess the effect of fenofibrate on apolipoprotein C-III (apo C-III), a key regulator of triglyceride metabolism. Materials and methods Randomised placebo-controlled trials investigating the impact of fenofibrate treatment on apo C-III levels were searched in PubMed-Medline, Scopus, Web of Science and Google Scholar databases from inception to 18 August 2017. Quantitative data synthesis was determined by a random-effects model and generic inverse variance method. Sensitivity analysis was conducted using the leave-one-out method. A weighted random-effects meta-regression was performed to evaluate glycaemic parameter confounders. Results Meta-analysis of 10 clinical trials involving 477 subjects showed fenofibrate therapy decreased apo C-III levels (weighted mean difference (WMD) −4.78 mg/dL, 95% CI −6.95 to –2.61, p<0.001; I266.87%). Subgroup analysis showed that fenofibrate reduced plasma apo C-III concentrations in subgroups of trials with treatment durations of either <12 weeks (WMD −4.50 mg/dL, p=0.001) or ≥12 weeks (WMD: −4.73 mg/dL, p=0.009) and doses of fenofibrate <200 mg/day (WMD −6.33 mg/dL, p<0.001) and >200 mg/day (p=0.006), with no significant difference between the subgroups. Conclusion This meta-analysis found that fenofibrate therapy significantly decreases apo C-III levels, an effect evident with both short-term treatment and doses less than 200 mg/day. This was the first systematic review to determine the effect of fenofibrate on plasma apolipoprotein C-III (apo C-III). The strength of this study was the use of the meta-analysis that used the increased population size compared with individual studies that were small and, in some instances, underpowered to discern if fenofibrate had an effect on plasma apo C-III. The limitation was that the small number of trials, lack of studies in patients with hyperapolipoproteinaemia C-III and lack of presenting gender-stratified results by individual studies. 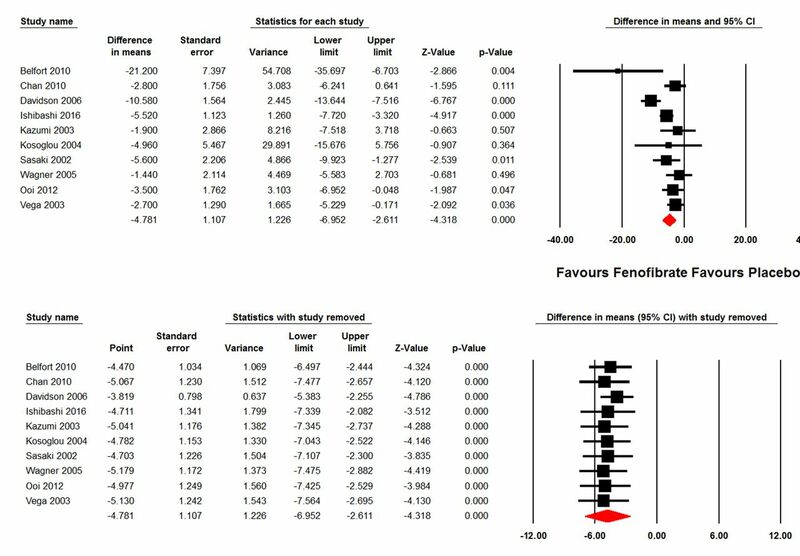 This meta-analysis of randomised placebo-controlled clinical trials using fenofibrate therapy aimed to determine its effect on apo C-III levels. This study was designed according to the guidelines of the Preferred Reporting Items for Systematic Reviews and Meta-Analyses statement.25 PubMed-Medline, Scopus and ISI Web of Knowledge databases were searched using the following search terms in titles and abstracts: fenofibrate AND (apoCIII OR apoC-III OR ‘apo CIII’ OR ‘apo C-III’ OR apoC3 OR ‘apo C3’) AND (placebo OR placebo-controlled). The wild-card term ‘*’ was used to increase the sensitivity of the search strategy. An example of the search strategy employed in PubMed-Medline is shown in online supplementary file 1. The search was limited to articles published in English language. The literature was searched from inception to 18 August 2017. Original studies were included if they met the following inclusion criteria: (1) being a randomised placebo-controlled clinical trial with either parallel or cross-over design, (2) investigating the impact of fenofibrate versus placebo on total circulating concentrations of apo C-III and (3) presentation of sufficient information on apo C-III concentrations at baseline and at study end in both intervention and placebo groups or providing the net change values. Exclusion criteria were: (1) non-clinical studies; (2) uncontrolled or non-placebo-controlled studies; (3) observational studies with case–control, cross-sectional or cohort design; (4) reporting postprandial plasma apo C-III levels and (5) lack of sufficient information on baseline or follow-up total circulating apo C-III levels. Eligible studies were reviewed and the following data were abstracted: (1) first author’s name; (2) year of publication; (3) country where the study was performed; (4) study design; (5) number of participants in the statin and control groups; (6) fenofibrate dose; (7) duration of treatment; (8) age, gender and body mass index (BMI) of study participants and (9) baseline and follow-up concentrations of plasma lipids, lipoproteins and apolipoproteins including apo C-III. When apo C-III data were incompletely reported, authors of the respective article were contacted to obtain missing information. Two authors (AS and LES) reviewed the papers, and disagreements were resolved through discussion and consultation with a third author (SLA). As potential confounders of treatment response, the duration of treatment and baseline plasma apo C-III concentrations were entered into a random-effects meta-regression model to explore their association with the estimated effect size on plasma apo C-III levels. 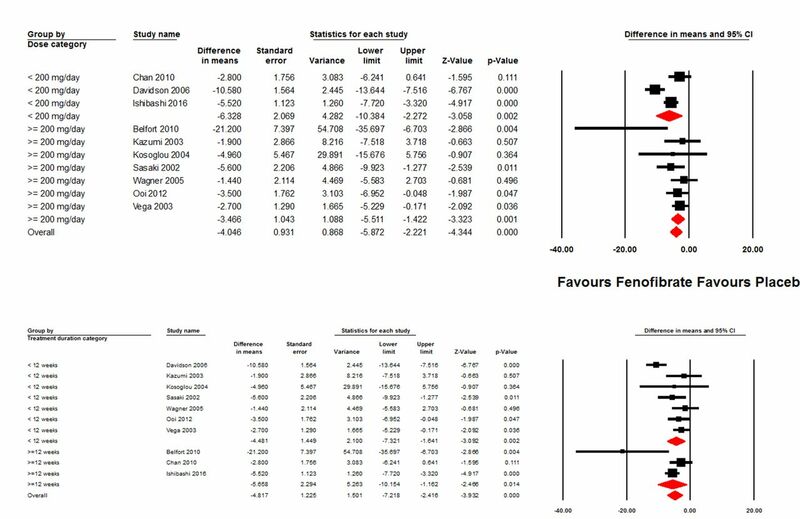 Evaluation of funnel plot, Begg’s rank correlation and Egger’s weighted regression tests were performed to assess the presence of publication bias in the meta-analysis. When there was evidence of funnel plot asymmetry, potentially missing studies were imputed using the ‘trim and fill’ method.29 In case of a significant result, the number of potentially missing studies required to make the p value non-significant was estimated using the ‘fail-safe N’ method as another marker of publication bias. No patients or public were involved in this study. Overall, 61 articles were found following multidatabase search. After screening of titles and abstracts, 22 articles were assessed in full text. Of these five articles were excluded because of lack of reporting serum/plasma total apo C-III concentrations, four because of duplicate reporting of data from the same population, two because of reporting postprandial apo C-III levels and one because of incomplete data on apo C-III levels. Therefore, 10 articles were found to be eligible for inclusion in the meta-analysis (figure 1). Flow chart of the number of studies identified and included into the meta-analysis. Apo C-III, apo C-III. Data were pooled from 10 randomised placebo-controlled clinical trials comprising a total of 477 subjects, including 265 and 212 participants in the fenofibrate and placebo arms respectively (individuals of the cross-over trials were considered in the treatment and control groups).30–40 Clinical trials reported different doses of fenofibrate. The included studies were published between 200234 38 and 2016. Treatment duration ranged from 2 weeks36 40 to 12 weeks.30–34 Study designs of included trials were parallel30 34 36 41 and crossover.31 33 35 37–40 Selected studies enrolled subjects with metabolic syndrome,30 type 2 diabetes,31 33 hypertriglyceridaemia,32 35 38 dyslipidaemia34 36 and non-diabetic subjects.40 Characteristics of the included clinical trials are presented in table 1. Most of the included studies showed insufficient information regarding the sequence generation and allocation concealment. Moreover, three trials had high risk of bias concerning blinding of participants, personnel and outcome assessors.36 40 Nevertheless, all selected studies were characterised by a low risk of bias for incomplete outcome data and selective outcome reporting. Details of the risk of bias assessment are shown in table 2. The present meta-analysis of data from 11 randomised placebo-controlled trials found a significant reduction of apo C-III plasma concentrations following treatment with fenofibrate (WMD: −4.56 mg/dL, 95% CI −6.53 to –2.58, p<0.001; I2 64.67%) (figure 2). The effect size was robust in the leave-one-out sensitivity analysis (figure 2) and not mainly driven by any single study. Subgroup analysis showed significant decreases in plasma apo C-III levels caused by fenofibrate in subgroups of trials with treatment durations of either <12 weeks (WMD −4.48 mg/dL, 95% CI −7.32 to –1.64, p=0.002; I2 70.74%) or ≥12 weeks (WMD −5.66 mg/dL, 95% CI −10.15 to –1.16, p=0.014; I2 69.61%), with no significant difference between the two subgroups (p=0.664). With respect to fenofibrate dose, significant reductions were observed in both subgroups of trials with administered doses of <200 mg/day (WMD −6.33 mg/dL, 95% CI −10.38 to –2.27, p=0.002; I2 83.26%) and ≥200 mg/day (WMD −3.47 mg/dL, 95% CI −5.51 to –1.42, p=0.001; I2 27.51%). Again, there was no significant difference between the subgroups treated with different fenofibrate doses (p=0.217) (figure 3). 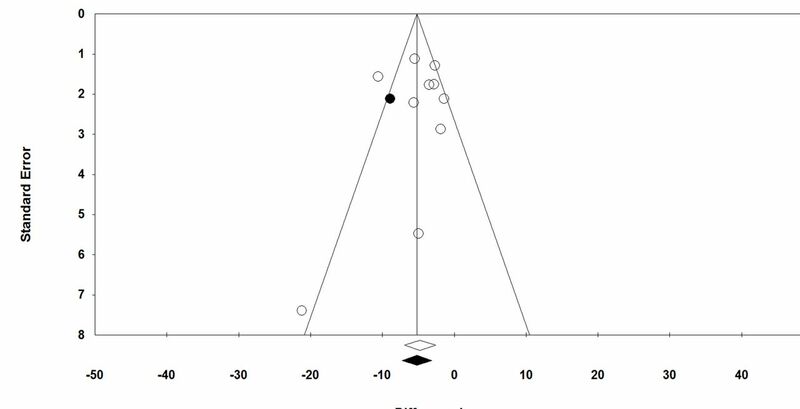 Forest plot displaying weighted mean difference and 95% CIs for the effects of fenofibrate on circulating apolipoprotein C-III concentrations. The lower plot shows the results of leave-one-out sensitivity analysis. Analyses were performed using a random-effects model. Forest plot displaying weighted mean difference and 95% CIs for the effects of different doses (<200 mg/day vs ≥200 mg/day) and durations (<12 weeks vs ≥12 weeks) of treatment with fenofibrate on circulating apolipoprotein C-III concentrations. Analyses were performed using a random-effects model. Random-effects meta-regression was performed to assess the impact of potential confounders on the effects of fenofibrate on plasma apo C-III levels. The results suggested a significant association between the apo C-III-lowering effect of fenofibrate with baseline apo C-III (slope −0.40; 95% CI −0.58 to –0.22; p<0.001) and baseline triglyceride (slope −0.02; 95% CI −0.03 to –0.01; p=0.001) concentrations. However, no significant association between the apo C-III-lowering and triglyceride-lowering effects of fenofibrate was found (slope 0.11; 95% CI −0.05 to 0.27; p=0.185) nor were there any association with baseline LDL-C (slope −0.02; 95% CI −0.12 to 0.08; p=0.677), HDL-cholesterol (HDL-C) (slope 0.35; 95% CI −0.29 to 0.98; p=0.284) and BMI (slope −0.75; 95% CI −2.08 to 0.58; p=0.269). Visual inspection of Begg’s funnel plots revealed a slight asymmetry in the meta-analysis of fenofibrate’s effect on plasma apo C-III levels that was imputed by one potentially missing study at the left side of the plot using ‘trim and fill’ method that yielded an adjusted effect size of −5.18 (−7.28 to –3.09) (figure 4). Begg’s rank correlation (p=0.592) and Egger’s regression (p=0.718) tests did not suggest the presence of publication bias. The results of ‘fail-safe N’ test suggested that 153 missing studies would be required to make the observed significant result non-significant. Random-effects funnel plot detailing publication bias in the studies reporting the impact of fenofibrate on plasma apo C-III concentrations. In the EPIC study, mediation analysis showed that a large part of the increased CAD risk associated with apo C-III was attributable to the triglyceride-rich remnant particle levels.7 This fits well with the mechanism proposed above. It has been also proven that fenofibrate decreases triglyceride-rich remnant particles.59 60 However, it was also shown that apo C-III was associated with an increased C reactive protein, a marker of inflammation that may represent an independent predictor of increased CAD risk.61 This finding may also reflect the LPL-independent mechanism of increased CAD risk by apo C-III. The present meta-analysis suggested that the effect of apo C-III lowering was relatively rapid as it was observed within 12 weeks, thus indicating the early potential benefit of fibrate therapy. However, no data exist that relate triglycerides reduction and remnant particles changes induced by apo C-III. Of note, the reduction of apo C-III levels was also observed with fenofibrate doses <200 mg/day, but it is unclear whether a reduction in apo C-III may occur even if in the absence of a therapeutic decrease in triglyceride levels. The main limitation of the present meta-analysis is that several trials were characterised by a small population size and a limited number of individuals. However, the pooled population analysed was sufficiently robust due to other studies that provided a large population size. In addition, included studies did not define elevated plasma apo C-III levels among the inclusion criteria and hence future trials specifically defined in populations with hyperapolipoproteinaemia C-III might be interesting. Finally, included the trials did not provide gender-stratified results for the impact of fenofibrate on plasma apo C-III levels; therefore, the presence of any gender effect on the apo C-III-lowering activity of fenofibrate needs to be evaluated in further studies. The results of the present meta-analysis showed that fenofibrate treatment significantly decreases apo C-III levels, even with short-term treatment and doses <200 mg daily.
. Treatment of hypertriglyceridemia: a review of current options. Physiol Res 2015;64:S331–40. , ed. Cochrane handbook for systematic reviews of interventions. London, 2009.
. Diabetes, plasma insulin, and cardiovascular disease: subgroup analysis from the Department of Veterans Affairs high-density lipoprotein intervention trial (VA-HIT). Arch Intern Med 2002;162:2597–604.
. Apolipoprotein CIII and triglycerides in the necrotic core contribute to plaque vulnerability in patients with stable coronary disease. European Journal of Cardiology 2017;5:42–3.
. The role of lipoprotein lipase in the metabolism of triglyceride-rich lipoproteins by macrophages. J Biol Chem 1983;258:9086–92. Contributors AS and LES-M contributed to the literature search, article screening, data acquisition and abstraction. AS contributed to the statistical analysis. SLA, AS and LES-M contributed to interpretation of the results and drafting of the manuscript. NK, ŽR, MB and MP contributed to critical revision of the manuscript. All authors approved the final version of the manuscript for submission. Competing interests NK has given talks, attended conferences and participated in trials sponsored by Amgen, Angelini, Astra Zeneca, Boehringer Ingelheim, Elpen, MSD, Novartis, NovoNordisk, Sanofi and WinMedica. MB has served on speaker’s bureau and as an advisory board member for Amgen, Sanofi-Aventis and Lilly. Data sharing statement All data are shown in the manuscript.